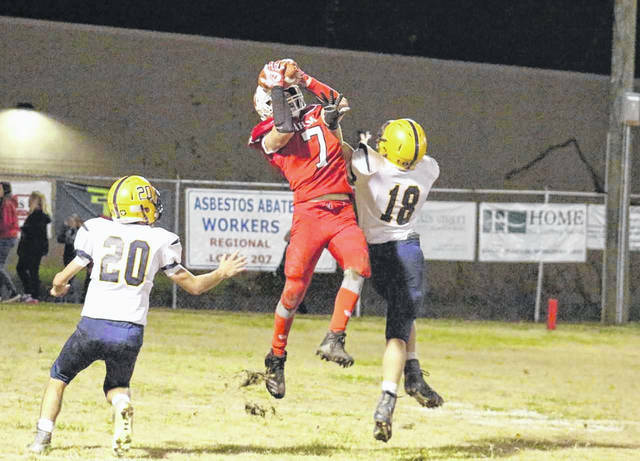 Wahama senior Tanner Smith (7) makes a leaping grab in double coverage, during the White Falcons’ season finale on Friday in Mason, W.Va.
MASON, W.Va. — It was the final flight for the White Falcons for the 2018 campaign. 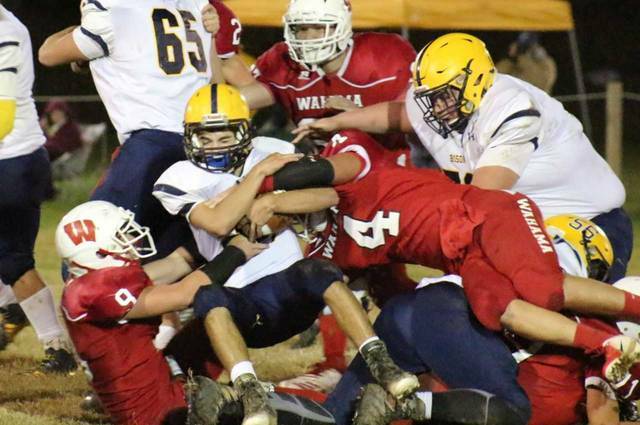 The Wahama football team trailed visiting Buffalo 21-12 through the first half of Friday night’s non-conference contest at Bachtel Stadium, but the Bison outscored the hosts 21-6 in the second half en route to a 42-18 victory. BHS (3-7) charged to an early seven-point advantage when Chase Lovejoy scampered for a 48-yard run to cap off a four-play, 68-yard drive a mere 1:36 into the contest. Buffalo tacked on its second touchdown of the contest with 7:35 remaining in the opening quarter, when Elijah Brock rushed for a 15-yard touchdown. The visitors, however, missed the point-after attempt to widen the margin to 13-0. The White Falcons (1-9) answered at the 8:09 mark of the second quarter, as Tanner Smith snagged an interception and returned it 26 yards for a score to narrow the margin to 13-6. The Bison, however, extended their advantage to 21-6 just 4:45 later when Brock punched in a one-yard touchdown run to close out a 10-play, 82-yard drive and Calen Marcum added a successful two-point conversion run. Wahama cut the deficit to 21-12 with 1:39 remaining until intermission, when Abrahm Pauley connected with Smith on a 66-yard touchdown pass. Following the break, Buffalo furthered its lead to 28-12, when Lovejoy provided an 18-yard rushing touchdown with 7:44 remaining in the third period. The Red and White tacked on its final points of the contest, when Hunter Board snagged a 26-yard touchdown pass from Pauley to cut the deficit to 28-18 at the 7:22 mark of the third quarter. BHS, however, furthered its lead to 35-18 just 5:13 later, as Marcum provided an 18-yard rushing touchdown. The Bison accounted for all of the scoring in the finale, as Marcum scampered for a 26-yard run to stake the visitors to a 24-point victory. Buffalo claimed a 22-6 edge in first downs, as the White Falcons were penalized seven times for 65 yards. BHS was conversely flagged eight times for a total of 90 yards. Both teams combined for nine turnovers in the contest, as Buffalo lost four fumbles and tossed one interception. 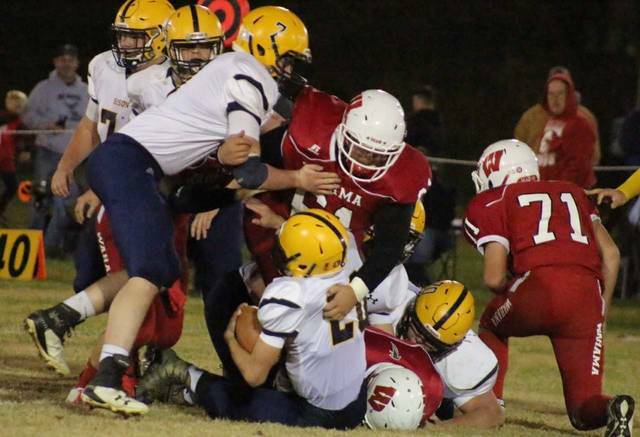 In contrast, Wahama threw three interception, while losing one fumble. There was a total of 702 of total offense as the visitors claimed a 319-58 in rushing yards, while WHS finished with a 213-112 advantage through the air. Brayden Davenport paced the rushing attack for the Wahama with 25 yards on four carries, as Brady Bumgarner was next with 22 yards on 10 touches. Pauley finished with an 8-of-18 passing performance, including two touchdowns, for 213 yards. Three different White Falcons players caught at least one pass, as Smith led the way with four grabs for 126 yards. Hunter Board was next with two catches for 51 yards, while Bumgarner had two receptions for 36 yards. The game served as the final contest for Wahama seniors Brady Bumgarner, Tanner Smith, Ronin Madill, Jacob Warth, Shawn Taylor, Bryce Meadows, Braden Weaver, and Jacob Fisher. Following the contest, WHS coach James Toth was candid in his response regarding the effort of his players throughout the season. 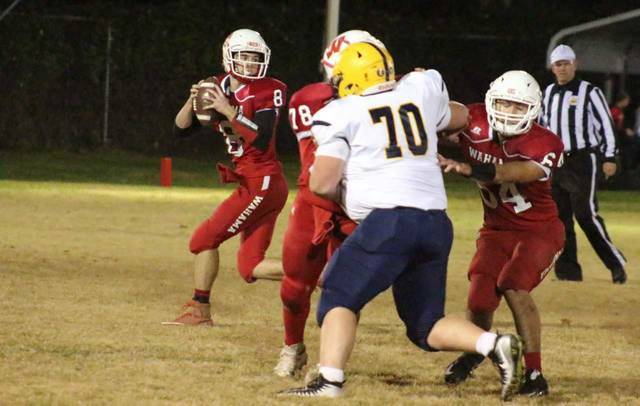 The White Falcons were 1-7 in TVC Hocking play and finished eighth out of nine teams.